Jamestown (UJ) The annual Dine and Bid Dinner and Auction has grown from modest beginnings over thirty years ago to be the University’s single largest fundraiser, and a much anticipated and enjoyed community event each spring. This year’s Dine and Bid, themed “Monopoly: Knight Edition,” will take place on Saturday evening, April 13, in the beautiful Harold Newman Arena. 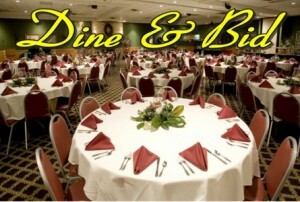 Last year Dine and Bid grossed $180,000 in support of student scholarships! A significant share of those funds come from businesses, personal sponsorships and cash donations. Even though Dine and Bid is still several months away, the Sponsorship Committee is now beginning to reach out to past and prospective sponsors. Here you can visit the sponsorship opportunities and register online. The link also includes a printable form to postal mail or email to UJ. *Individual ticket invitations will be sent closer to the event date.